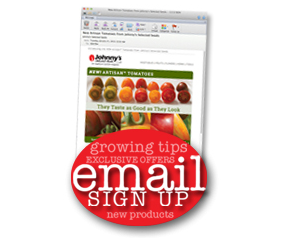 For more information on tomatoes as noted in the June Advantage newsletter, please click here. Thank you! Spring is officially here, and growers throughout most of North America can plant outside this month. In this issue, we'll focus on getting crops off to a strong, healthy start and doing it as efficiently as possible. Both soil temperature and air temperature affect the germination and early growth of vegetables. Your optimum planting dates have to take both into consideration, to ensure that seeds germinate quickly and evenly, and that conditions after emergence are right for that crop. In the Johnny's catalog, you'll find a graph showing minimum, optimum, and maximum soil temperatures for each vegetable. Here's some advice on how to use those graphs to your benefit. As you look at the temperature graphs, you'll notice that the most favorable temperature for almost all vegetables is quite warm, 77-86F/25-30C. In most places, however, those soil temperatures don't occur until spring is well under way. If you waited for soil to get that warm, you would run the risk of the weather getting too hot too soon for your cool-loving crops. Also, you would be trying to plant everything in the same week. A better strategy is to plant when the soil temperature is somewhere between minimum and optimum. You can plant at the minimum temperature if the weather forecast is for continued warming. The range of temperatures between minimum and maximum gives you plenty of leeway to spread out your planting workload over several weeks in spring and make succession plantings well into summer. The chart below shows the order in which you can direct seed spring crops, based on their frost tolerance and germination temperature requirements. Measure where you are going to plant because temperatures can vary across a field. Soil temperature can be affected by a number of factors including mulch or crop debris on the soil surface; orientation of the field, with south-facing fields warming fastest; and soil moisture, with dry soils warming quicker than wet soils. Insert the bulb only as deep as the seeding depth, usually no more than 2". Wait two or three minutes before removing the thermometer. Take a reading in the morning, when soil is coldest, and another in late afternoon, when it's warmest. Average the two to get the average daily temperature. When your target temperature has been achieved for three days in a row, you're good to go! If soil remains too cool beyond your normal planting date, try placing row cover on hoops above the bed. It will warm the soil within a few days and the row cover will provide a beneficial environment for early growth. For extra warming, lay IRT mulch film or black biodegradable mulch film on the bed. Get the mulch taut and in contact with the soil for maximum benefit. The seedlings that you have tended so carefully in the warm, humid greenhouse will soon be planted outside, where they will be exposed to wild temperature swings, wind, rain, and brilliant sunshine. It's a tough transition for plants, one that can set them back severely unless you take the time to harden them off. Hardening off means introducing young plants gradually to the world outside. This process is easy when you have a few flats of plants; you can put them outside for a few hours and gradually increase the amount of time each day for a week or so. But when you're a commercial grower, with dozens or hundreds of flats, you don't have time to move plants in and out of the greenhouse twice a day. Here are some suggestions for hardening off plants on a market farm. Most growers create a separate hardening off area apart from the greenhouse, where plants can be moved for a week before being planted outside. Ideally, the hardening off area will be cool, bright, and with some wind exposure yet also have emergency heating in case the temperature takes a dive. An unheated hoophouse makes a good hardening off area for transplants. If the doors and sides are open during the day, the plants get acclimated to outside conditions. Closing the hoophouse at night protects them from low temperatures and deer. A second option is a low tunnel made of hoops and row cover. It can be a temporary structure, right outside the greenhouse, with pallets for a floor to hold seedling flats. If the greenhouse has roll-up sides, the hardening off area can be built along the sidewall so that it can get heat from the greenhouse if necessary. Some growers use their farmers market canopies to provide shelter for transplants if frost is not expected. Others have tables set up under trees or near buildings that cast some shade during the day. In both cases, it's important to have hoops or posts on which to hang row cover or poly at night for additional cold protection. Hardening off involves more than acclimating plants to weather. The process should also help plants adjust to lower levels of fertilizer and water than they received in the greenhouse. Fertilizing can be stopped and watering reduced in the week before moving the plants outdoors to harden off. A light foliar feeding of kelp just before moving them out will help the plants deal with cold stress. Then, two or three days before planting in the field, the transplants should be fertilized with fish emulsion or other liquid nitrogen fertilizer to help them resume growth. For more examples of how market farmers harden off transplants, see this article in Growing for Market. When it's time to direct seed or transplant your crops, Johnny's has a wide range of planters to make your work go faster and cause less back and knee strain. There's a tool for every application, from the Earthway seeder that makes direct seeding as easy as walking, to the Hatfield transplanter, which lets you plant seedlings without bending. You have to see these planters in action to really appreciate the labor savings they afford. 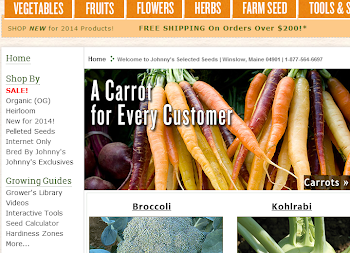 Go to Johnny's video library to see which planting tools will work best for your farm and crops. While your thoughts at this time of year may be focused primarily on the delicious vegetables you're growing for market and your own table, don't forget about cover crops. Early spring is the best time to plant many crops that will benefit you in the months and years ahead. Here are some examples of ways to use cover crops. Plant nitrogen-fixing legumes to increase soil fertility for a subsequent crop. Plant buckwheat in an area reserved for summer vegetables or flowers to prevent weeds in the meantime. Plant Johnny's Spring Green Manure Mix now then plow it in later in the season to increase organic matter and nitrogen. Grow a living mulch by underseeding brassicas with New Zealand white clover. Plant grains such as spring wheat, barley, and oats to harvest as food, or use some as ornamentals in bouquets and wreaths. For a detailed description of cover crops, including valuable advice from Johnny's farm manager, download our Cover Crop Comparison chart. Just wanted to say thanks for the video on pruning tomatoes. I was on track, but the side instruct on the basket weave was an eye opener. I just tie my tomatos to stakes throughout the season. "Weaving" looks so much easier. And the tip about "heading" 30 days before last frost? Invaluable. THANKS!! !